Rob is an Adelaide magician available to hire for functions, parties and corporate shows. 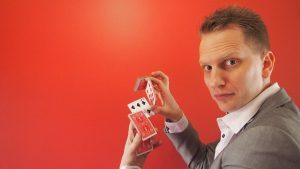 Guaranteed to leave people astonished and amused, Rob is a gentleman magician specialising in close-up strolling magic, perfect for entertaining guests at both cocktail and dinner events. Experience at working events both large and small, from corporate functions to engagement parties, Rob is sure to make your guests gasp with wonder. Rob has always had a fascination with magic, and after being shown how to do a simple coin vanish eight years ago, made the change from spectator to performer. Since then he’s devoted his time to learning a multitude of arcane secrets, from mind reading to metal bending. Rob is a member of the International Brotherhood of Magicians and made his Adelaide Fringe debut in 2017 performing with five other magicians in Magic on the Edge, which enjoyed a sellout season. In 2018 Rob performed his solo show Card Play to rave reviews from audiences at The Adelaide Fringe, and in 2019 returns to Fringe with a brand new show… Magic McMagic Face! Copyright © 2019 Rob Ellinger – Magician. Theme: Himalayas by ThemeGrill. Powered by WordPress.